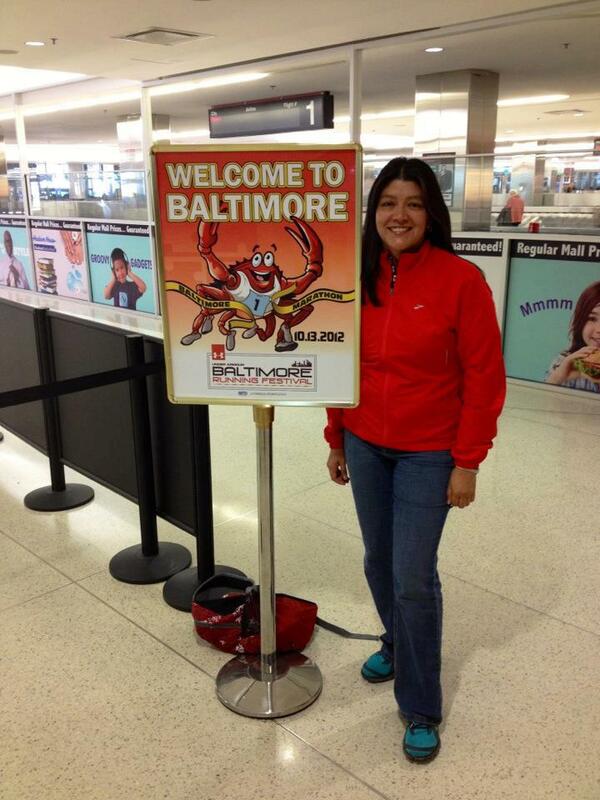 On Friday I flew out to Baltimore to run another half marathon. I was kind of iffy about it because I knew there were going to be hills. Ugh, I dislike them very much. Oh well, can’t always run a flat course just like in Chicago. My flight got in at noon and my friend picked me up. However, my luggage did not make it on the plane so the next flight out from Chicago would not arrive around 1:30. No problem. I filled out a report and was told that if I went back to pick up my luggage, Southwest would give me a $50 voucher. Sweet. My friend and I went to the expo. As usual I bought stuff that I did not need. I bought two shirts and another iFitness belt. Well, what I really wanted was the one that holds the bib. I already have a belt with two pouches but I thought it was a different belt for the bib holder. Later on I found out all I needed were the two cords to hold the bib. Sigh. Do you need an iFitness belt? If so, please contact me. The day of the race it was cold in the morning. 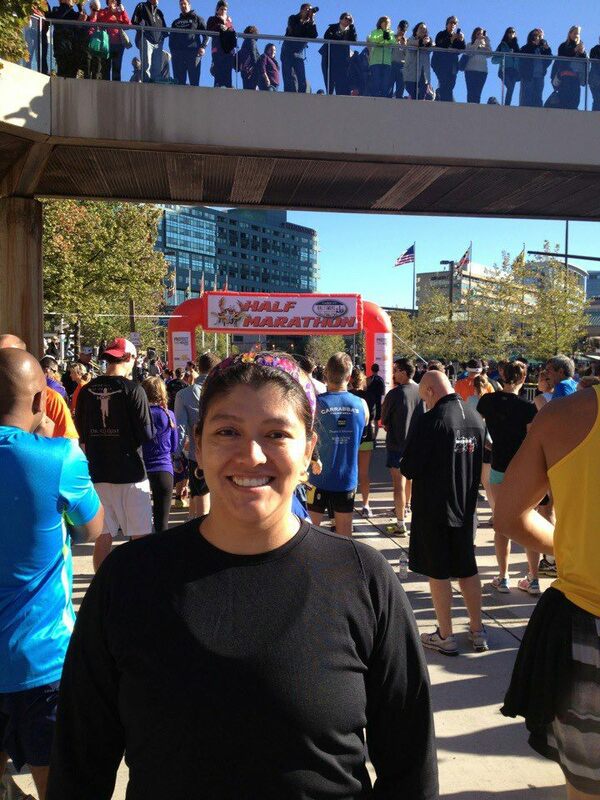 The half marathon began at 9:45 which gave us plenty of time to get on the light rail, use the bathroom, and get some rest before the race. I had a short sleeve on along with a long sleeve. By the time the race began, it was kind of warm so I took it off and tied it around my waist. I did not have a finish time goal. All I wanted was to finish in time to get something to eat, shower, and be ready for a shuttle pick up at 1:40 to head back to the airport. The course took us through some nice areas of Baltimore. I ran close to John Hopkins and immediately thought of Henrietta Lacks. If you get a chance, read her book “The Immortal Life of Henrietta Lacks”. One of my favorite parts of the course was running around Lake Montebello which was about 1 mile long and flat. The race began and was immediately welcomed by hills. I started off too fast with the rest of the runners. When will I learn NOT to do that? I walked through most of the hills. I made a mental note to train for hills. The nice thing is that whenever there are hills, there are always downhills. Around mile 11 I had to run up a bridge. Seriously? Why are there hills/inclines towards the end of a race? As I mentioned before, when there is a hill there is also a downhill. I just wanted to be done with this race. I looked at my watched and realized that I could still finish it in less than 2:30. Mile 12 was another favorite part of mine. There were so many people out there. I swear that whole mile was filled with people. It was great to see that towards the end of race. I felt energized and motivated to keep on running. My official finish time is 2:28:45. I am very pleased with my time. One day I will do a sub-2. I did not like the area around the finish line. I know. So many people. What did I expect? 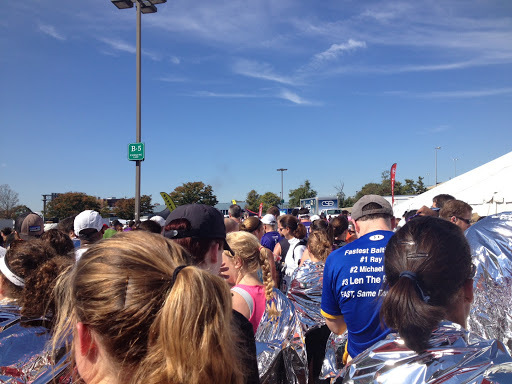 As soon as I crossed the finish line, I could not move forward because there were so many people in front of me. The holdup? Volunteers were handing out those heat sheets. People please move. I have an hour to shower and eat before my shuttle pick up. Next race is Indiana on Saturday, October 20th. Overall, this was a great half marathon. Despite the hills, I did like the course and was pleased with the weather and my finish time. I seriously envy all your traveling for races. There are several races I'd lile to run, but it's a little out of the budget right now. Nice time for a hilly course! Will be in CA next year! Not sure whether to do the Rock 'n' Roll Half Marathon in San Diego, San Jose, or Los Angeles. Wow- you are traveling all over the place! Baltimore has a reputation for being challenging. At least you had good weather for it. Congrats on a nice race! Nice job in Maryland. I'm still not sure which race to run there!